We use our cars to go to work, school or places of leisure. Some of us drive to and from these locations every day. While on the way there, the journey becomes more relaxed if we are listening to some music. This is where a car audio system comes in. Our cars come equipped with a radio receiver and possibly a CD player unit. These stock parts produce good sound but it is often not quite as clear and crisp as we would want. Therefore, many of us turn to aftermarket products and construct our own unique car audio systems. A car audio system consists of many parts. These include the speakers, amplifiers, equalizers, cabling and possibly an extra battery. These parts range in price from affordable ones to wildly expensive units. 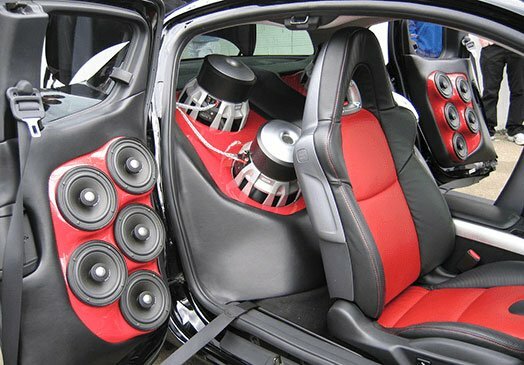 Read on to find out how to build a budget-friendly audio system for your car. This is the most important step when you begin the journey of building an affordable audio system for your car. You need to identify how much money you want to spend on it. Start by determining which parts you want for your car audio system. Do you want a head unit which is equipped with only a CD player or one equipped with USB and iPod ports too? Also, do you want Bluetooth technology, bass speakers, DVD screens or a GPS receiver in your car? Find out what you want and perform some research to find out the lowest prices you can get for each part you want. After that, add up the prices and get an estimated total. This is the budget which you will work with going forward. This is the heart of your car audio system. You may decide to change the stock car stereo in your car and replace it with an aftermarket unit that produces better sound. Also known as head units, car stereos are diverse. Some have just a few features while others have it all. Refer to the features which you decided to search for as you were making your budget. After that, find a car stereo which has these features and is affordable. Once you do, purchase it and move on to the next part. An aftermarket car stereo is not powerful enough to power your car audio system. Thus, you need a unit that can boost the signal from the car stereo to the speakers. This unit is known as an external amplifier. There are two types of amplifiers. These are the mono channel and the multiple channel amplifiers. A mono channel amplifier can only send signal to one speaker. On the other hand, a multiple channel amplifier can send sound signal to many speakers. There are multiple channel amplifiers which can handle up to 6 speakers. It is advisble to buy a multiple channel amplifier. This is because you can always connect new car audio equipment to it in future. Perform some research so as to find an amplifier unit which can power your front and rear speakers. Remember to check the power rating of your amplifier. You do not want to send more power than your speakers can handle. This can damage them. A subwoofer is a special type of speaker which is designed to deliver poweful bass. You car audio system is not complete without a subwoofer or two in the mix. Picking a multiple channel amplifier helps you to direct signal to your new subwoofer easily. For example, if you chose a 5 channel amplifier, you can use 4 channels to deliver signal to your speakers and the fifth channel to deliver sound signal to your subwoofer. There are many sizes of subwoofers. Examples of these are the 8 and the 10 inch subwoofers. Car audio amplifiers normally have some special characteristics which you should know about. Examples of these are their power handling capability or RMS, load of impedance, range of frequency, sensitivity and overall size. There are very many brands of subwoofers today. Sift through them to find a good unit that is affordable and can deliver the bass you desire. Once you buy these individual parts of your car audio system, you are halfway there. Now you need to install them in your car.You can hire a professional car audio specialist to perform this for you. At a fee, they can swiftly prepare, install and test your car audio system. On the other hand, if you want to save some money, you can install them yourself. If you have a background in electrical engineering, then this process will be a breeze. However, if you don't, find an instruction manual to assist you in the process of installation. There are such manuals in electronics shops and on the Internet. If you decide to go down this path, observe safety first. Wear protective gloves, a visor and be aware of the electrical power as you install your car audio system. If you are successful, you can go ahead and enjoy your favorite tunes through your affordable car audio system as you cruise down the highway.